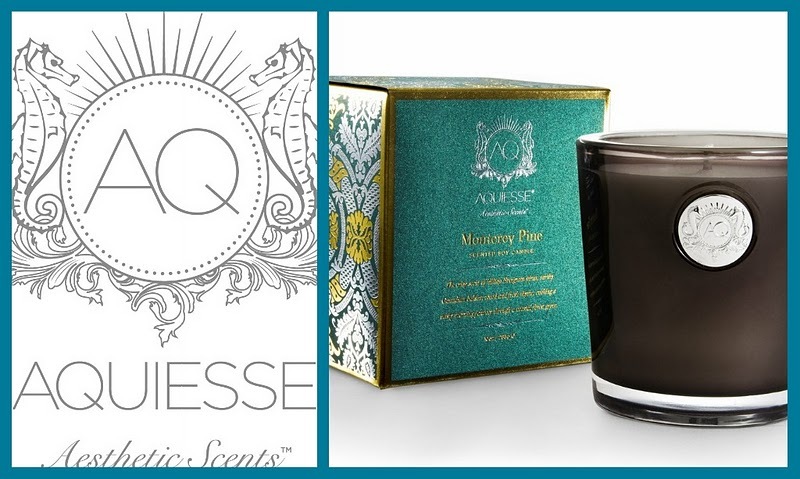 Aquiesse is a luxury home fragrance brand that is inspired by the rich coastal regions of Central California. Since I live on the Central Coast, I was delighted when I was contacted to review this lovely candle. I was lucky to enjoy "Shoreline" and upon opening the box I felt like I was being taken to a fabulous vacation. As you can see even the box is beautiful and felt like a passport to experience the ocean air. Inside of course, is the lovely smoke-brown glass with their gorgeous seahorse crest that will easily fit to your house's decor. You can find these great candles at Bloomingdales, Planet Beauty, Candles off Main and many other retailers. These candles have a 45 hour burn time, so you can experience the California coast for a long time and believe me that is a good thing. I am excited to try their Monterey Pine next, especially for the upcoming holiday season. We will be spending this Christmas, seaside but the scent of pine needles will definitely make it feel like Christmas around our beach house. To learn more about Aquiesse you can find them on FB and twitter. Sounds so delicious, and I love the seahorse crest on the glass!! i'm in the market for new candles. Your french is great!!!! Nice to read you...and thanks for your message!!!! !